Our bacon cult adds a new member. We’ve sold bacon wrapped in black pepper from our friends in Mt. Petit Jean, Arkansas, for a long time. It’s become a lead member of our bacon cult, a hard-to-ignore blend of sweet, spicy and smoky. 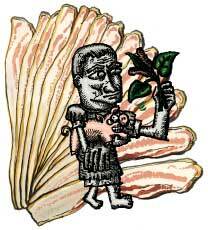 Now we have the same bacon wrapped in a jacket of Balinese long pepper. Long pepper was a favored spice during the Roman empire and was used in American colonial cooking, where it probably found its way to bacon. The flavor is wilder than your standard peppercorn, like we used a combination of peppers, not just one. Easy to get hooked on—watch out.